Does the ‘Atkins Diet’ prove that low carb diets are the best? No. The Atkins Diet proves that most people and the ‘experts’ can’t resist a good gimmick. Low Carb diets are not more effective than other diets and they are less livable, less forgiving and less safe than other ways of eating, especially than low fat diets. Low carbohydrate diets are not new and they have long been known to produce dramatic and rapid weight loss, but only for a few weeks. After that, they work about as well as other diets and unfortunately, most people can’t tolerate the side effects of low carb diets long enough to get very far before they give up. This leaves a whole lot of “failed” dieters with the impression that low carbohydrate diets are “powerful” but that they (the dieter) are failures. The truth is much more complicated. Low carb diets produce fast weight loss for one reason: water loss. Most people can lose 10-15 pounds of body water in the first week on a low fat diet. This dehydration occurs for two reasons. First, the human body cannot make much carbohydrate on its own. If we eliminate carbohydrate from our diets, we hit a wall pretty fast. Generally the body hates running out of carbs so when they stop coming from food, they start coming from our bodies. First we begin using up glycogen, a kind of sugar found in our livers. In total, our livers hold about a pound of glycogen. Usually this pound is exhausted within the first two days on a low carb diet. Does this mean that we lose a pound of weight? No. It means we lose 10-15 pounds of weight. Because glycogen is never found by itself in the liver. It is always chemically ‘bound’ to a lot of water (in roughly the same way that hardened concrete is chemically bound to water). And one pound of glycogen binds about 10-15 pounds of water. So when our glycogen gets used up (because we stop eating carbs), we lose a pound of glycogen and about 10-15 pounds of water. THAT is the first reason that low carb diets produce rapid weight loss, but there is more. Once we have used up all of our glycogen and it’s 10-15 pounds of water, now our body faces a real crisis. The problem is that our brain can only live on blood sugar or, in an emergency, on chemicals called “ketone bodies”. Once we have run out of glycogen, we have run out of blood sugar and so the body is forced to begin making ketone bodies to save the brain. Once we start making ketone bodies (and we normally do not), we have entered the metabolism of starvation. Ketone bodies are emergency brain fuel, but they are also a strong diuretic. This means that they pull even more water out of the body and therefore cause even more weight loss. So you can see that within 3-4 days on a very low carb diet, people can lose a LOT of weight, sometimes in excess of 15-20 pounds. But you can also see that nearly all of that weight is water loss, first from glycogen depletion and then from ketone-body-induced diuresis. In other words, it’s NOT fat. So I repeat: the initial rapid weight loss from low carbohydrate diets is almost all water and is NOT fat. At the end of about a week, a low-carbohydrate dieter has lost a lot of water and a little fat. But of course most people don’t know the details; they just know the numbers and the numbers look great. Unfortunately, they’ll never look so great again because the water loss is over. After that, it’s slow going (because now the weight loss really is fat and only fat). So the “miracle” of the first week on a low carb diet will never come again. By about the second or third week of following a low carb diet, most people are getting pretty frustrated and sometimes more than a little sick. The rapid water loss is now history and daily headaches and dizziness (from ketone body-induced dehydration) are a daily reality. Naturally low-carb dieters become tempted to cheat when the weight loss has slowed down and the side effects have set-in. So they DO cheat; and they cheat by eating carbohydrate. And this is when the nightmare really begins. The body hates ketosis. As soon as we eat carbohydrate again, we stop making ketone bodies and therefore lose the diuretic effect they cause. Then comes the glycogen and it’s water. Essentially, everything that happens on the first week of a low-carbohydrate diet (all the water loss) happens in reverse when people start re-feeding on carbohydrate. Any diet that produces fat loss does so because it produces calorie reduction. If we factor out the water loss seen with low-carb diets, what we find is that they are nothing special. They are just another low calorie diet and they can do no more long-term good than other diets. Unfortunately, they can also do a lot more harm. Low carbohydrate diets produce abnormal inflammation throughout the human body and this is not healthy. Growing scientific evidence tells us that abnormal inflammation leads to or plays a role in many serious chronic illnesses including heart disease and cancer. Given a choice, people eat carbohydrates. This is true in every culture on Earth and it has been true down the ages. Yes, it is also true that during ancient ice ages many humans were forced to eat almost nothing but meat and they survived. Many Eskimos lived on nothing but whale meat and blubber too. But this is NOT what people prefer and it is not what most humans eat, now or ever. Scientific inquiry is a political creature shaped by culture. In 1997 when millions of Americans stopped eating low fat diets and began cutting carbohydrate intake because of the popularity of “Dr. Atkins’ New Diet Revolution”, scores of doctors and researchers around the world slowly and quietly abandoned 30 years worth of accumulated data on the health benefits of fat reduction and remade their careers singing the praises of and publishing data related to the ‘benefits’ of carbohydrate reduction. None of this would have been so bad if it weren’t for the fact that low fat diets and low carbohydrate diets are mutually incompatible. If low carbohydrate diets really are great diets for weight loss, then low fat diets simply cannot be…and visa versa. Low carb diets must be high in fat and low fat diets must be high in carbohydrate. A diet that is high in carbs and fat isn’t a diet and a diet that has no carbs or fat isn’t safe. So the embrace of low carbohydrate diets by the scientific establishment meant a rejection of low fat diets. This in turn entailed rejecting the results of some of the greatest studies in medical history including, by and large, the Framingham Heart Study. I believe this was a terrible mistake. Sometimes science shatters our most cherished notions but usually it just tweaks them. Galileo was right, but history doesn’t have many Galileos. History has a lot of Bozos though. Dr. Atkins was one of them and he made clowns out of a whole lot of doctors, nutritionists and researchers. The Framingham Heart Study isn’t wrong, Atkins is wrong. Low fat diets aren’t harmful, low carbohydrate diets ARE. 4 billion people living in Asia aren’t thin because of an “Asian Paradox”, they are thin because they eat very little fat. Low carbohydrate diets are high in fat. This presents a problem in trying to explain why they work because fat is the most calorie dense macronutrient. How can eating MORE of that which has the most calories cause weight loss? Well the obvious answer, and the truthful one, is that low carbohydrate diets are “ketogenic” meaning that they force the body to make “ketone bodies” and ketone bodies act as a sort of appetite suppressant so that low-carb dieters simply eat much less food. Yes, they are eating mostly fat and protein, but they are eating very little of these things. So far so good. But the story doesn’t end here. The problem is that ketosis, and by extension, low carb diets, is/are very “brittle” meaning that they either work well or they fail to work at all. There is no wiggle room on a low carbohydrate diet. If you eat even a modest amount of carbohydrate, ketosis stops and hunger returns with a vengeance. This makes low carbohydrate diets no different than low calorie diets. They too work and they too are brittle. But they are unlivable, terribly unlivable, and so are low carbohydrate diets. We aren’t robots after all. If Atkins had simply stopped here, I wouldn’t question his claims, but he takes it much, much farther. He doesn’t just say that low carb diets work because they are low calorie diets, he says that they work because carbohydrate is a form of ‘poison’ that causes weight gain by altering appetite regulating hormones in the human body. Specifically, he argues that carbohydrate, through its well-documented effects on insulin, causes metabolic obesity. When he makes THIS claim, he has gone too far. Atkins didn’t invent the claim that carbohydrate poisons the body. He stole it. And he stole if from the work of a brilliant Australian researcher named Jeanie Brand-Miller who expanded upon the studies of earlier researchers showing that for diabetic patients, carbs do indeed matter. What Dr. Atkins stole is an idea now called “The Glycemic Index” and this is where the low carbohydrate story gets interesting. Type 2 diabetes is a disease characterized by resistance to the blood-sugar regulating hormone called insulin. People with type 2 diabetes produce insulin, but their bodies no longer respond to it normally. In healthy people, insulin causes muscle and other tissue to absorb sugar from the blood. In diabetics, this breaks down and blood sugar levels increase, particularly when diabetic people eat sugar. And dietary sugar is especially bad for diabetics because, as you can perhaps imagine, it causes blood sugar to rise very rapidly and rather high. This means that people with diabetes tend to have a much easier time controlling their blood sugar if they avoid foods (like sugar) that cause their blood sugar levels to rise fast and high. But how do we know when a food causes blood sugar to rise very fast and high? In some cases, as with dietary sugar, it’s obvious. In other cases like potato, it’s not obvious. And so we need some way of measuring how fast and high blood sugar rises in response to different foods. THIS is the Glycemic Index and it has gone a long way in helping diabetic people control their illness. The relevance of glycemic index to diabetes led some people to wonder if rapidly absorbed carbohydrate (through its effects on insulin) leads to weight gain. In order to test this, they compared weight loss in patients on low glycemic and high glycemic diets. And sure enough, people on a low glycemic diet lost more weight. Does it mean that rapidly absorbed carbohydrate like sugar or potato causes weight gain? Or is something else going on? It turns out the key to glycemic index is dietary fiber. The more fiber a food has, the lower its glycemic index. So people eating a low glycemic diet are also, necessarily, eating a high fiber diet. And this, it turns out, perfectly explains the weight loss they see. So there is no need (and no reason) to believe that carbohydrate absorption rate affects weight. Low glycemic diets work for the wrong reasons. Low glycemic diets work because they are high fiber diets and fiber has lots of “bulk” and no calories. It fills us up at no extra cost. Who Cares WHY it Works IF It Works? So what if low glycemic index diets cause weight loss because they have fiber? Because you can get fiber a lot more easily in other ways, namely by supplementing your diet. In other words, there is no need to endure the complexities and tedium of a low glycemic diet because all you have to do is eat more fiber. But What Does this Have to Do With the Atkins Diet? So Atkins took the flawed idea of glycemic index-that rapidly absorbed carbohydrate causes weight gain-and made it even worse. Atkins doesn’t just say that rapidly absorbed carbohydrate is bad, he says that ALL carbohydrate is bad because it affects insulin. But where is his proof? In the already debunked glycemic index studies that I just mentioned. But Again, If the Atkins Diet Works, Who Cares Why? Same reason as with glycemic index: Because there is an easier better way that uses principles that are truly valid. Low fat diets on the other hand work for a very simple reason: because fat has most of the calories and carbs and proteins don’t, you can eat a whole lot of carbs and protein if you don’t eat fat. And you still get fewer calories. 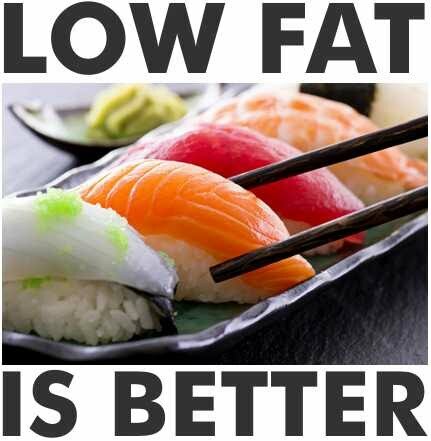 Low fat diets work because they reduce the calorie density of food.